Earlier this year, HTC launched three terrific phones based on their HTC "One" line: the HTC One S for T-Mobile, the HTC One X for AT&T and the HTC EVO 4G LTE for Sprint. Notably absent was the nation's largest carrier, Verizon; leaving the field wide open for Samsung's Galaxy S III, Motorola's Droid Razr MAXX HD and, of course, the iPhone 5. HTC finally filled in that gap with the new Droid DNA. But the Droid DNA isn't just a rebranded One X. It sports a new 5-inch super LCD3 screen that displays full HD resolution (1080p) at a whopping 440 pixels per inch—far higher than any other phone on the market. Add in a quad-core processor and 2GB of RAM, and this is clearly HTC's new flagship device. It all sounds good on paper. But do these features really make a difference? Read on to find out. With bigger displays, come bigger phones. And that is not often a positive thing for phone ergonomics. However HTC has done an admirable job at keeping the 5-inch display on the Droid DNA wrapped in a relatively manageable package that is only .38 inches thick and weighing a hair over 5.0 ounces. I didn't find it significantly different to hold than the One X or Galaxy S III, which have 4.7 and 4.8 inch displays, respectively. The Droid DNA also has a rubberized plastic back that makes for an excellent grip—a welcome change from the slickness of the Galaxy S III. The buttons on the Droid DNA have a high-quality feel and are well integrated into the red accent strip, with enough separation so you can operate them by touch alone. The one exception to the Droid DNA's excellent overall build quality is a ridiculous little plastic flap that covers the bottom USB jack. It has the dual strikes of feeling cheap and making access to the USB port much more difficult. The Droid DNA's biggest bragging right is its 5-inch super LCD3 display. With full HD (1080p) resolution and a pixel density of 440 pixels per inch, nothing else even comes close in terms of specs. But how does that play out in practice? Well, there's no denying that the Droid DNA display is beautiful. Text looks incredibly smooth and it's bright enough to do a good job in sunlight, but it's not exactly a world-changer. Even on 50-inch HDTVs, you would be hard-pressed to notice the difference between a 720p and 1080p set under normal viewing distances. The same holds true for phones. Can you see the difference when you stare hard at the edges of text? Yes. Do you normally stare really hard at the edges of text? No. Is it really cool to know you have the highest pixel density of any phone? You bet. Call quality on the Droid DNA was very good and the speaker phone was also excellent. The headphones have a built-in amplifier that provides impressive volume. Too often, I find myself cranking up the volume to max on my phones so I can hear music at the gym. I tried that with the Droid DNA and nearly blew my ears out. The Droid DNA also includes Beats Audio, which boosts the volume and bass even further, though I prefer the flatter response with Beats turned off. The Droid DNA uses Verizon's LTE network and delivers very quick speeds. I averaged downloads around 12Mbps in New York City—not as fast as Verizon's LTE network used to be before the onslaught of 4G devices, but still plenty fast. The Droid DNA's quad core processor made quick work of web pages. The Droid DNA shares the basic underlying camera technology as the HTC One X, and takes similarly excellent shots. In my opinion, the overall combination of picture quality and camera features gives the Droid DNA the best camera of any smartphone on the market. First off, the 8MP camera has impressive picture quality. And the Droid DNA's HDR mode can work miracles in ultra-low light situations. I've managed more than acceptable shots in dark restaurants where lesser cameras would have produced nothing more than shadows. Secondly, as with the One X, the Droid DNA has unique camera controls that are actually quite useful. The photo capture and video record button are right next to each other on the main screen—no shuttling between screens to shoot photos and video. You can also capture full resolution images while shooting video. The other useful improvement is a burst capture mode that lets you take up to 99 photos at 4 frames per second—you pick the best one and then the rest are automatically deleted. The camera also has near-zero shutter lag. Press the button and you have your photo. Video quality is excellent, as well. And I love the slow motion option for shooting my kids playing sports. The Droid DNA ships with Android 4.1 Jellybean and HTC's Sense 4+ skin. Sense 4+ offers new features, such as automatic grouping of photos into event based on time and location, that are helpful. Navigation was quick with no lags. I'm still not a huge fan of HTC's keyboard and wish they would improve on some obvious deficiencies, such as not placing a space after a word when you select it from the suggestion list and non-intuitive suggestions for common words (how is "it's" not a suggestion when I type "its"?). Verizon adds in its share of bloatware that can't be uninstalled, including apps like VZ Navigator, which serve no purpose other than to extract even more fees from Verizon customers. For a phone which is so media-centric, it's odd that HTC did not include an SD card slot on the Droid DNA. Instead, you're stuck with 16GB of built-in storage, 11GB of which is available for use. That's fine for most users, but it's going to fall short for media junkies. I found the battery life to be excellent under normal usage. I had no trouble getting through the day and into the next, with occasional checking of email, phone calls and web browsing. However, that battery runs down fast if you're doing processor and screen intensive tasks, such as playing games or watching video. And since the battery is not removable, you'll want to keep a portable charger handy. The HTC Droid DNA is available from Verizon for $199.99 with a two-year customer agreement or on Amazon Wireless for $149.99. 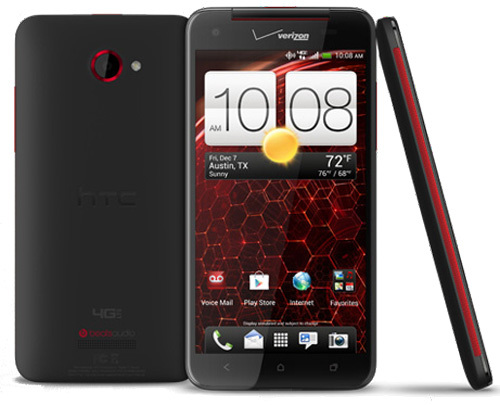 The HTC Droid DNA is a terrific phone and should be a top choice for Verizon customers. It has a beautiful display, the best camera on the market and plenty of power for games, movies or whatever you throw at it. For most people, I would recommend the HTC Droid DNA over the Samsung Galaxy S III because of its more useful camera features and less plasticky build quality, but it's a close call. You can read our review of the Galaxy S III and make that determination for yourself. When you compare it to the iPhone 5, it becomes a matter a size. If you find the Droid DNA too large to hold comfortably (and some will), the iPhone will be the better choice. On the other hand, if you find the iPhone 5 display too small to read easily (and some of us over the age of 40 do), you'll love the Droid DNA.